Mission: To provide our clients with exceptional travel services bound to exceed expectations through dedicated staff and premium quality experience. Vision: Committed to be one of the premier corporate and globally competitive travel agency in the country that offers the best services to our present and future clients. Travel and Tours was established on April 3, 2017, at G/F East 1900 Bldg. Gate 3 Vista Verde Executive Village, Felix Avenue,Cainta, Rizal, when a group of friends, spearheaded by Mrs. Rosellen Oliveros, who treat each other as families, decided to put up their own travel agency with a traditional yet professional practice. It started with an initial dynamic staff of seven (7) who experienced working at Thomas Cook Philippines, an international travel agency. At Levy Travel and Tours, our client’s best interest would always come first, and everything we do is guided by our values and professional ethics. We will ensure that we hire professionals who are well-experienced in the travel and tour industry. Levy Travel and Tours offers a wide and superior variety of services for the convenience of its customers. These include outbound and inbound tour packages, and international and domestic ticketing. 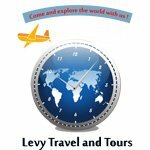 Levy Travel and Tours also aims to boost the brand awareness and maintain the relationship among its corporate customers. The company’s target markets are corporate accounts interested in travelling for business and leisure. These are Doctors, Lawyers, Executives, and Medical Representatives. In addition, the company’s desire is to be at the top of the market and position itself upon its target market that Levy Travel and Tours provides a high-class service at an affordable price that will leave an indelible impression at its customers. On the other hand, Levy Travel and Tours’ logo is clock around a globe because it symbolizes the availability of the company 24/7, all around the world. Levy Travel and Tours assures convenience to its customers when choosing their desired destination because the company has large and strong connections around the globe which makes everything (from booking to travelling) makes easier. The tagline “Come and explore the world with us” only mean we want the best travel experience for our beloved customers.